Congratulations to John Noyes on the publication of his new book Herder’s Essay on Being. A Translation and Critical Approaches. 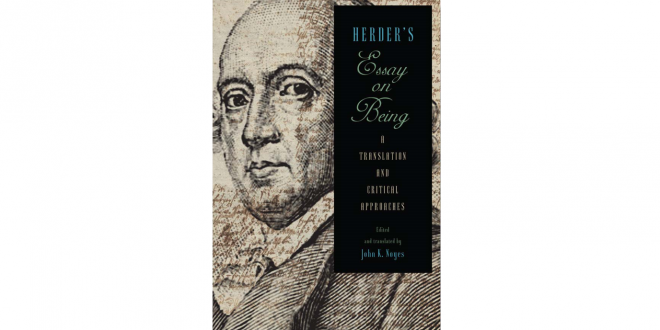 This book presents the first English translation of Herder’s foundational essay along with critical responses to it by today’s leading Herder scholars. In recent years, Johann Gottfried Herder has been the focus of much interest in the English-speaking world. While he was long disregarded, current scholarship in both German and English is revisiting his importance as an early theorist of the limits of Enlightenment. Increasingly, scholarship is remembering that in the closing decades of the eighteenth century Herder was one of the most important alternative voices to Kant. Herder’s Versuch über das Sein (Essay on Being, ca. 1764) was likely composed in reaction to Kant’s lectures on metaphysics. In it, Herder unfolds his philosophical project, setting the terms that remained the foundation of his work throughout his life and influenced Hegel, Nietzsche, Heidegger, and others. Given the central importance of the essay and Herder’s increasing recognition in the English-speaking world, it is striking that it has not been translated into English until now. This volume presents a facsimile of the manuscript along with a German transcription, an annotated translation, and critical essays by the most important Herder scholars writing in German and English today.